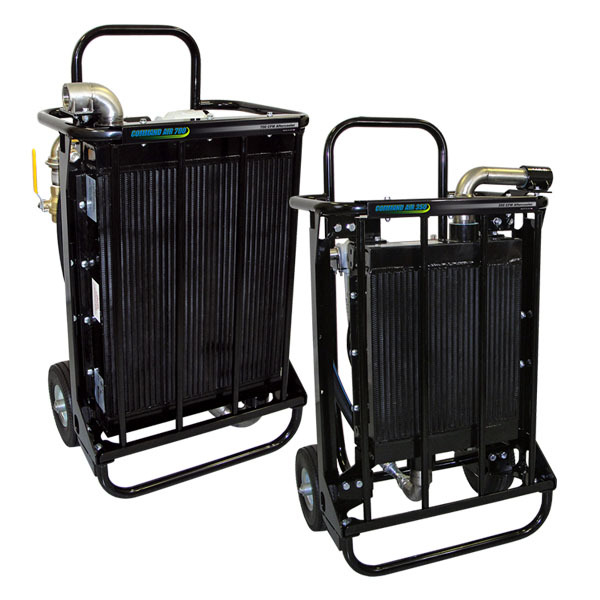 COMMAND AIR Aftercoolers offer a portable solution for moisture removal from commercial air compressors. Suitable for most blasting applications, the COMMAND AIR 350 efficiently cools, filters and dries the hot moist air produced by air compressors. Built tough for portable applications, both aftercooler models features self-purging automatic drains, robust steel frame and airless tires for easy mobility. The 350 aftercooler is the ideal solution for supplying a single dry ice blaster, sand blaster, soda blaster or any other equipment requiring cool, dry air for operation. For heavy duty applications requiring a higher air flow or for running two machines/compressors simultaneously, choose the larger COMMAND AIR 700. Suitable for most blasting applications, the Command Air 350 efficiently cools, filters and dries the hot moist air produced by air compressors. Built tough for portable applications, the Command Air 350 features self-purging automatic drains, robust steel frame and airless tires for easy mobility. A high quality coalescing grade air filter (.7 micron) removes particulate and a moisture filter efficiently removes water from the air supply, providing dry, filtered air to your equipment. This aftercooler is the ideal solution for supplying a single dry ice blaster, sand blaster, soda blaster or any other equipment requiring cool, dry air for operation. 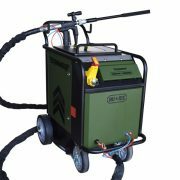 Ideal for heavy duty dry ice blasting applications, the Command Air 700 efficiently cools, filters and dries the hot moist air produced by diesel air compressors and can handle up to two compressors / blasters simultaneously. The Command Air 700 features self-purging automatic drains, robust steel frame and airless tires for easy mobility. 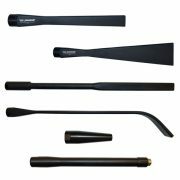 A high quality coalescing grade filter (.7 micron) removes particulate and a moisture filter efficiently removes water from the air supply, providing dry, filtered air to your equipment. This aftercooler is the ideal solution for supplying single or tandem dry ice blasters, sand blasters, soda blasters or any other equipment requiring cool, dry air for operation.